The Custard TV: British actors lead new US drama. British actors lead new US drama. British actors Dominic West (Appropriate Adult) and Ruth Wilson (Luther) are to star opposite one another in a brand new US show for Showtime. The new series is entitled The Affair. The network, whose hits include Homeland and Episodes have already began to trail their new drama which has yet to find a UK home. The story will be told separately from the male and female perspectives using the distinct memory biases to both misdirect and intrigue. Ruth Wilson (Luther) plays Alison, a woman waiting tables at a popular Hamptons diner, trying to piece her life back together in the wake of a tragedy. Her husband, Cole (Fringe's Joshua Jackson), struggles to keep it all together, with his wife and with the financially strained ranch that has been in his family for generations. Their emotionally charged marriage becomes even more complicated when Alison begins an affair with Noah (Dominic West, The Wire), a New York public school teacher and aspiring novelist who is spending the summer at his in-laws' estate out on the island. ER's Maura Tierney plays Helen, Noah's wife of 17 years. In an article for The Hollywood Reporter writer Sarah Treem teased the different style of writing that she hoped for set the series apart. "We think of the show as more about marriage," Treem told reporters Friday at the Television Critics Association's summer press tour. "The term affair will prove somewhat ironic if you keep watching the show." 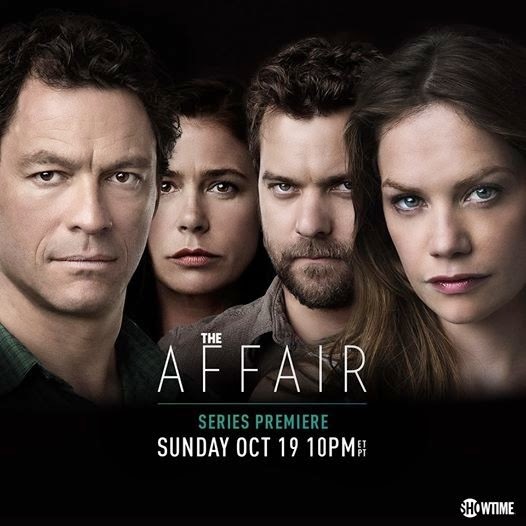 The Affair starts Sunday 19th October on Showtime in the US with no word on UK broadcaster yet.